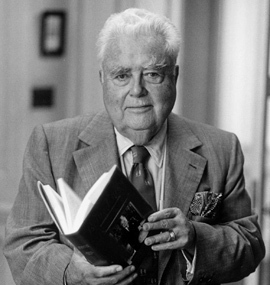 Herman B Wells walked the paths of Indiana University Bloomington as a student, faculty member, university president, and finally as our University Chancellor and guiding light. In each role, he lived the best values of Indiana University and inspired others to do likewise. Wells had a radiant personality, a talent for service, and a deep and abiding love for Indiana University. A leader of uncommon vision and generosity, he was the architect of IU's rise to greatness. His legacy continues to permeate every corner of the university. Created in 1961 by the Indiana Memorial Union Board of Directors, the Herman B Wells Distinguished Senior Award honors one outstanding senior who has excelled academically and is an established leader within the IU community. Recipients of this award exemplify the spirit of Herman Wells. To commemorate this honor, the recipient's name is permanently displayed in the Indiana Memorial Union. The selection committee considers the following criteria when evaluating each candidate. Complete the online application. The application requires that you upload a current resume, 3 letters of recommendation (which can also be sent directly by the recommenders to srawards@indiana.edu), and 2 short essay responses (no more than 700 words for each response) on the topics below. Please describe one of your outstanding academic achievements. Describe how your leadership and involvement in campus activities have made an impact on the Indiana University community.